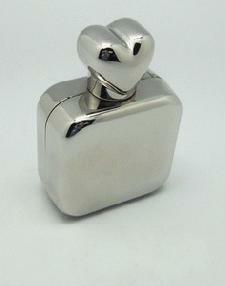 Personalised Atomiser Gift with Heart Lid is a perfect gift for a female client or customer. The atomiser is the perfect size for any handbag and is finished in a polished silver, it makes the perfect impact. We are able to engrave the atomiser with a company brand or logo, helping you make a great impression with your client. It would make an excellent freebie or giveaway with any purchase... But be sure to order quick! For a free quote on our Silver Atomiser please click here for our online enquiry form.